I made Daigakuimo, which is vegan Japanese sweet potato sweet snack. 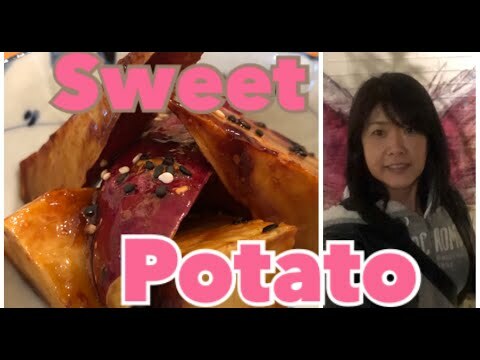 It is a famous food in Japan and caramelized sweet potato. Usually deep fry sweet potato, but this recipe, I used only one frying pan — this way, less messy and very easy and quick way to make this delicious food. You should try this yummy fall and winter food in your home. 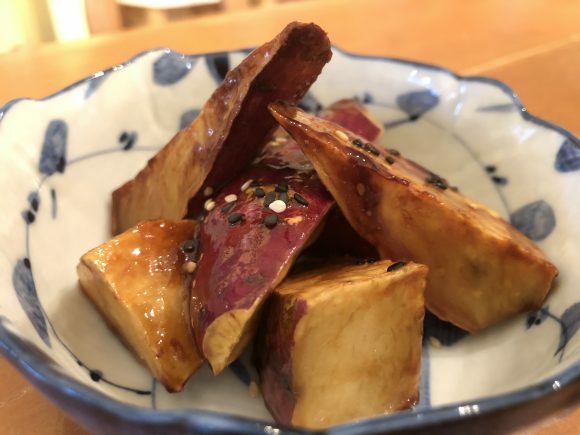 I like Japanese sweet potato, and I love this dish. Sweet potato is winter food, and it is not cheap ingredients in Japan, I think. My friends from the Kyushu area said when they were a kid, they use to eat for a snack when my friend came back from Japan, and they are tired to eat it. I would say, I wouldn’t! I wish I were their home. I think especially the Kyushu area. Sweet potato would be dirt cheap. By the way, my hometown where I went to high school is one of the famous producing areas for sweet potato. However, still, Kyushu is the probably number one producing area in Japan, so my high school town is not so cheap to buy some sweet potatoes.